Tonight, it feels like November. It was dark out as I was leaving work. The air had a distinct chill to it. It felt like the kind of night where you want to stay in and make a comforting meal. So, I turned to one that my mom made all the time when I was growing up. "Cottage Pie," as we called it in our house, had many incarnations throughout my childhood. It started out as the classic beef and mashed potato dish that it is expected to be--the meat sauteed with onions, then simmered with salt, pepper, and beef bouillon. Right before baking, tomato sauce was added to the meat. But, then it morphed. It seems there is someone in our family, who may or may not be me, who hated mashed potatoes. So, the cottage pie was baked without the mashed potatoes, but with American cheese melted on top, for a while. Then, it mutated again, and grew a crescent roll crust, over which the meat was spooned, and then the cheese melted. Eventually, I think it came full circle and the mashed-potato-hater among us agreed to allow them to top the dish once more--though I do believe the layer of cheese remained. When I began making cottage pie in my own kitchen, the ground beef was switched out for ground turkey--I just like it better. The crescent roll crust was abandoned, as was the melted cheese layer. Essentially, I went back to the original recipe, except for the ground turkey aspect. The thing about this dish is that as it cooks, I can close my eyes and be magically transported back to 8 Marwood Drive. Mike would be getting home from baseball practice. I would finally be finishing my AP U.S. History homework. Mom would whip this together, with something green on the side, and this is what we would eat together. This is the weeknight food of my childhood. Now that I am 6-7 weeks away from having a baby of my own, I can't help but wonder what foods my child will come to think of as "home." Sure, chicken soup will probably top the list, just as it does for me. But, that is a big production and, at least for me, is associated with holidays and snow days and times when someone in the family was sick. I'm hoping pot roast will top the list--again, as it does for me--but, again, pot roast encompasses the tastes and smells of holidays and extended family gatherings--not of normal weeknight dinners when it is "just us." And so, I wonder what smells and tastes will transport my child, when he or she is in their 20s, back to our kitchen table. 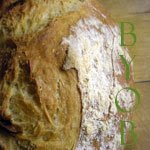 Will it be the smell of bread rising? Of garlic sauteing in olive oil? Will it be cinnamon in the middle of summer--not during the holiday season, as it is for most--as the zucchini bread bakes? What will our kitchen smell like in the coming years? And how will that shape the person we are about to raise? While I contemplate these questions, I will share with you one of the quintessential recipes of my childhood, which, even while I am twenty-eight and far from New York, comforts me on a cold November evening. Edited to add that I have found the wonderful, heart-warming Family Recipes event, hosted by Shelby, of The Life and Loves of Grumpy's Honeybunch. While I've been reading through past round-ups, I decided to make my first submission. This recipe seems to fit the bill nicely, tied as it is to my childhood dinners. Hop on over to Shelby's blog to view the roundup after December 1. Brown onion and meat. Drain fat. Add salt, pepper, and beef cube that has been dissolved in 1/2 cup water. Cook for about 20 minutes. Add sauce. Bring to full boil. While the meat is cooking, cook cubed potatoes in water. Mash the potatoes with 2 Tbs butter and salt and pepper. Make sure to taste them before putting them on top). 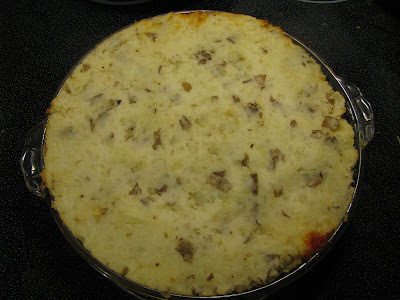 In a pie dish, put meat mixture on the bottom, and the mashed potatoes over it. Bake at 400 degrees for 25-30 minutes, until golden brown. Allison, this is such a lovely post. You really touched my heart with the writing of this! Thank you for participating and I hope you will continue to! Congrats on the coming addition to your family! I have twin 13 year old daughters and I am teaching them about cooking and hoping that I am passing on recipes and traditions. I also know that I am making memories for them as I am sure you will do for your child. I have a shepherds's pie (cottage pie) on my blog that my kids love. There are many great variations out there. Thanks for sharing yours. What a wonderful post! I have 3 children in their 20's and I enjoy hearing them talk about their favorite foods; love it when they call and ask for recipes. What a lovely post (and excellent recipe). Thanks for submitting (I'm the other host/co-creator of the event :) ).